A 20 bedded multispeciality critical care unit is the crown of this 200 bedded hospital. It has 15 years of history, making more survivors from the deadly diseases, gained a reputed stature in this locality. Machines and Manpower are the two pillars of such units. This critical care unit is a well equipped with mechanical ventilators, non invasive BIPAP machines, infusion pumps, blood gas analysers, continuous ECG and BP monitors, pulseoximeters, pace makers, haemodialysers, invasive pressure monitors and so on. A team of highly competent specialist doctors are available here round the clock so that the procedures and the care is delivered to this sick patients without any delay. Nurse:Patient ratio here is 1:2 for non ventilated patients and 1 : 1 for the ventilated patients. A fully airconditioned unit with pleasing interiors will give the patient a feel of being in a hotel. Infection control measures are well taken and the patients are out of cross infection dangers. Mortality rate in this unit is low when compared to the other such units, the team of doctors here always result oriented and the quality of care is well monitored. 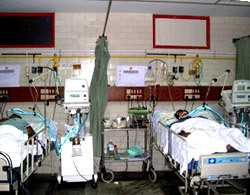 QUALITY CARE AT AFFORDABLE PRICE is our motto and this ICU is known for is cost effectiveness.